Tag line: "What You Can't See Can Hurt You"
In 1999’s Lake Placid, there’s a scene where Hector (played by Oliver Platt) is showing Sheriff Keough (Brendan Gleeson) an online video of a crocodile, submerged under water, sneaking up on its prey (an animal drinking by the side of the river). In a split second, the croc leaps out of the river and drags its poor victim in. That, for me, is what makes crocodiles so damn spooky: the fact that they might be nearby, waiting for the right moment to attack, and you have no idea they’ve locked on to you. 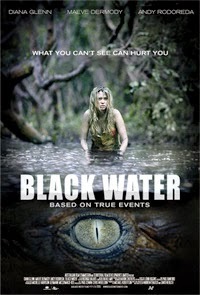 Black Water, a 2007 Australian film about three people stalked by a killer crocodile, plays on these fears by barely showing us the creature, yet letting us know that it’s always nearby, and has no intention of leaving until it’s had its fill. While on vacation in the Northern Territory, Adam (Andy Rodoreda) and his girlfriend Grace (Diana Glenn), along with Grace’s sister Lee (Maeve Dermody), take a day trip to a mangrove swamp to do a little fishing. While out on the water, their boat is attacked and capsized by a crocodile. Their tour guide Jim (Ben Oxenbould) is killed, leaving Adam, Grace and Lee to fend for themselves in the middle of nowhere. Will the trio find a way out of this predicament before they, too, fall victim to the very hungry croc lurking nearby? A suspenseful film, Black Water manages to accomplish quite a bit with its limited resources (the movie was made for around $1 million). Despite the fact we seldom see the crocodile, the filmmakers remind us, every chance they get, that it’s still there. Following the attack on their boat, the three leads scamper up a nearby tree, hoping it will keep them safe. The problem is they’re all alone in the middle of the swamp, meaning if they want to escape this dangerous situation, they’re going to have to do it themselves. Of course, every solution they come up with has the same glitch: they have to get closer to the river (sometimes in it) to pull it off. Whenever they attempt to do so, the camera follows along, floating over the water's surface as if to remind us there’s a killer somewhere underneath, and, like the main characters, we have no idea where it is. I always confuse this movie with "Rogue" and "Primeval" BEC they all came out around the same time. I remember them being all good. Do you give this one the edge, Doc? Ah, yes... I remember this one! I agree with you all the way, Dave! Good choice!